The second day of our Australian Adventure (read about our first day here) sees us eagerly awaiting a 3 a.m. pick-up by Hot Air Balloon Gold Coast, for, well, a hot air ballooning adventure. (Australia, it is becoming apparent, is the place for the adventurous!) We leave the golden beaches behind for the day, and venture into the green hinterland (‘the green behind the gold’). In the bus that fetches us from the Surfers Paradise Marriott Resort & Spa, we are informed that a panel of experts is studying wind patterns to determine the launch field. 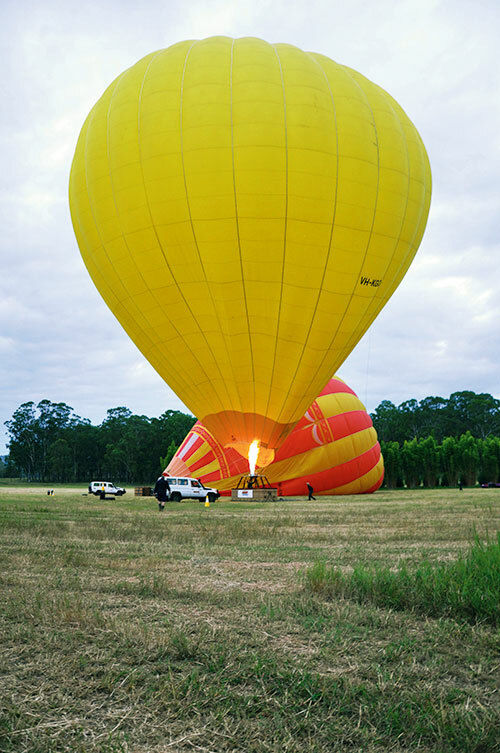 Once there, after balloon inflation, a thrilling sight in itself, we discover ourselves floating between the rolling green Gold Coast Hinterland and the Surfers Paradise skyline. The early morning sun rises slowly, sending bright daggers through the clouds. Though the view of Tamborine Mountain and Lamington National Park with the Gold Coast skyline in the distance can barely rival the one from Q1, the sensation of floating on the wind seems to take away all cares until we are warned that we could have a bumpy landing. No worries, as the Australians would say. We land in a field cushioned with tall grass and jumping out of the basket (a little tricky, that), everyone lends a hand with squeezing the air out of the large balloon and fitting it back into its very-large bag. 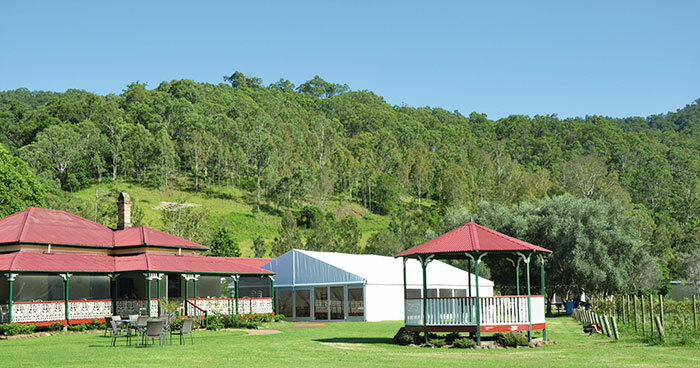 We drive to a relaxing champagne breakfast at O’Reilly’s Canungra Valley Vineyard at their historic grand homestead with high ceilings and wide verandahs, where the in-house pet dog brings his tattered rubber ball to each visitor hoping for a throw. Only 30 kms from the Gold Coast and 70 kms from Brisbane, the Tambourine Mountain plateau offers breathtaking scenery and abundant wildlife and Darren Wallace of Southern Cross 4XD Tours is just the man to drive us through it in his magnificent 4XD that he loves. 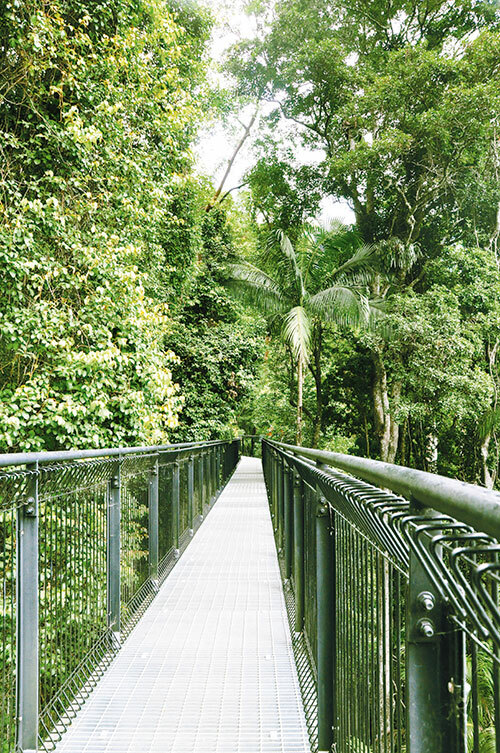 Away we go to the Tambourine Rainforest Skywalk, an amazing stretch of privately owned rainforest with spectacular elevated walkway through the beautiful middle and upper canopies of the rainforest. Brendan Moore is the general manager and the son of the family that owns the place. Exiting the Eco Gallery, he walks us a short way along the 1.5 km walk which is a combination of forest floor trails, 300 metres of high-tech steel bridges tracking through the highest points of the upper canopy and a 40-metre cantilever bridge that soars a breathtaking 30 metres above the creek and rainforest below. Darren points out leaves that feel like sandpaper, plants that could prove very painful if touched, trees that shed their bark leaving behind baby-bottom smooth trunks…. Tambourine Mountain, part of an ancient volcanic rim with an elevation of around 550 metres above sea level, has so much to offer and right now, Johnny Depp is shooting his next Pirates of the Caribbean somewhere in the rainforest…. Besides Depp, however, there are fantastic lookout points, spectacular waterfalls, breathtaking coastal views, picnic areas, BBQs, trail rides, a boutique wine trail and spas. We visit Jasmine Organics, a pretty estate laden with aromatic and healing plants, that uses the best natural plant-based ingredients to create a safe, luxurious, award-winning skincare range. 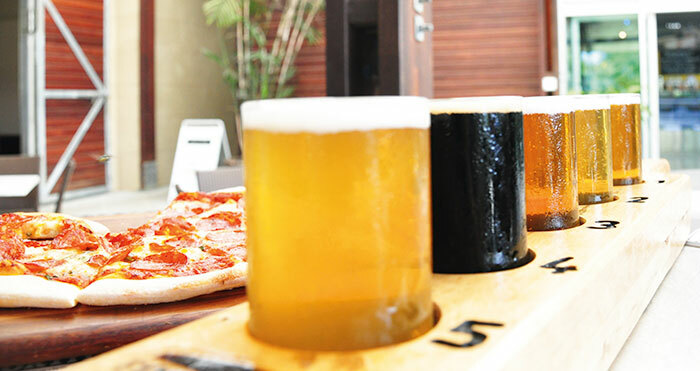 We taste some good beer at the Mount Tambourine Brewery and some wonderful handcrafted cheeses at the Witches Chase Cheese Company, made using traditional methods and vegetarian rennet. We meander along the Gallery Walk, which comprises a cluster of galleries and craft shops displaying from fine art to frivolous artefacts. Later, we pump adrenaline on an off-road drive with Darren and his magnificent machine, on the lookout for koalas and kangaroos in the wild, though they evade us…. Stay tuned for more Gold Coast Adventures.